Enjoy Free Parking While Away on Vacation! 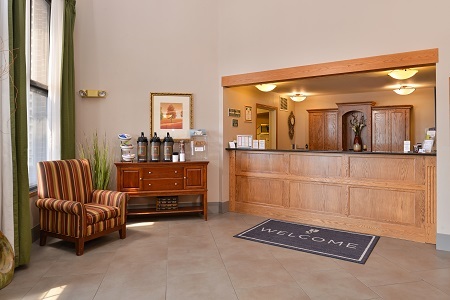 Make the Country Inn & Suites® by Radisson, Fargo, ND your metropolitan home base while visiting the picturesque Red River Valley. Gather your group to explore the West Acres area, where you’ll find extraordinary shopping, dining and entertainment, or head to the Red River Zoo for a fun family excursion. Visiting with a sports team? 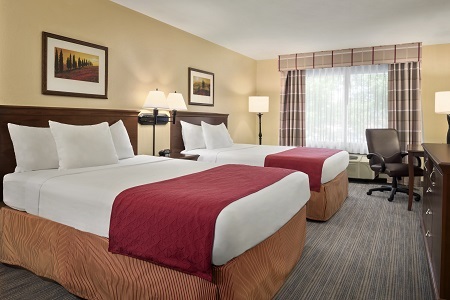 Our hotel lies within five miles of the Sports Arena, Johnson Soccer Complex and Jack Williams Stadium, making it easy to attend tournaments or group practices. For longer trips, reserve our Extended-stay Suite which features a king bed, a sleeper sofa and a dining area with a table for two. Cut down on travel costs by keeping your entire crew fueled with our free, hot breakfast. 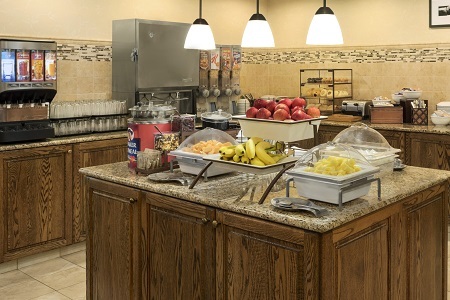 Guests can dive into fresh bagels, fluffy eggs, warm sausage and more, all paired with complimentary coffee. Worked up an appetite for lunch or dinner? Gather for a memorable meal at The Country Pub, located on site. Featuring a full bar, three big-screen TVs and outdoor seating, our inviting pub provides a warm atmosphere for socializing with family, colleagues and teammates. There are also plenty of excellent restaurants near our 13th Avenue location. Take a one-minute stroll over to Crooked Pint Ale House for delicious craft beer, juicy burgers and more! West Acres – In addition to more than 80 stores, West Acres mall offers an aquarium, a movie theater and a fun play area for the kids just a 10-minute walk from the hotel. Browse the racks at popular stores like Express, LOFT and Talbots, or grab a quick bite to eat at one of the 15 dining options, including Panera Bread. North Dakota State University – Prospective students, visiting families and alumni alike appreciate our proximity to the home of the Bison. Take the short four-mile drive to campus, where you can attend concerts, football games and live events at the FARGODOME. Scheels Arena – Sports fanatics are situated just 11 minutes from the exciting action of the Fargo Force hockey team at this popular arena. Be sure to check the schedule for upcoming games, as well as big-name concerts, conferences and various expos hosted year-round. For convenient meeting and wedding reception space less than five miles from Hector International Airport (FAR), reserve one of three on-site conference rooms at the Country Inn & Suites. Host up to 175 guests for a grand affair in the combined Prairie and Meadow rooms, or hold intimate gatherings in the smaller-scale boardroom. You can also take advantage of amenities like free Wi-Fi and ask our knowledgeable staff for audiovisual equipment rentals to help enhance your gathering.